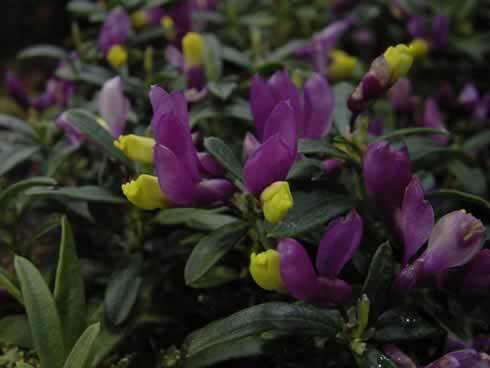 Low growing ericaceous plant with evergreen foliage and purple & Yellow flowers. 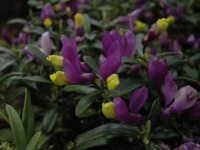 A small but very attractive evergreen perennial which flowers very early in the season, long before others have woken up. This low growing thicket forming shrublet has thick deep green leaves at around 2 cms long held on short multi-branched stems. These tend to rise from sub-surface rhizomes which can make good ground cover with time. The flowers are yellow with purplish-pink wings, borne in early spring.